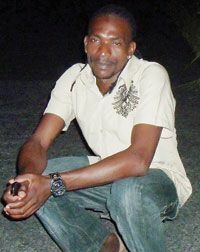 Birthday greetings to Andrew Adams of Chateaubelair, who celebrated his birthday on the 24th March. Greetings from your mother Pamela Adams, children Andrea, Ciara and De-andra, brothers & sisters, all residing in Canada, friends and family, and not forgetting your fiancÃ©e Kimorn Samuel and your in-laws. May God bless you now and forever. Sending 100% of love from Canada to you Andrew.